This reserve, on the eastern tip of Anglesey, is owned and managed by the North Wales Wildlife Trust (NWWT). Mainly a limestone outcrop, Mariandyrys consists of a wide range of habitats including heathland, herb-rich grassland and scrub. Views of the surrounding coast and countryside from the nature reserve are wonderful. 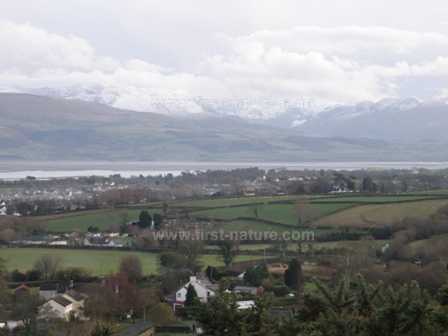 On Anglesey take the B5109 from Beaumaris to Llangoed and then follow signs to Glan yr Afon. Just before the village of Llangoed there is a telephone kiosk on the left, with a parking area immediately behind, where it is advisable to leave your car and take the short walk up the steep hill to the nearest reserve entrance. Parking is very limited at the entrances of the nature reserve. There are three entrances to this nature reserve. The first of these leads to the old quarry and is through private land and access requires permission from the owners. It is better to continue the short distance up the hill and to use either of the other entrances, the first of which is opposite the road signed to Penmon and has a gate, a stile and an interpretation board with information about the wildlife of the reserve. Paths from this entrance join those running from the main entrance, which is a further 150 metres up the hill. Many of the paths on the reserve are steep and are not suitable for wheelchair users or for prams and pushchairs. There are no facilities at the reserve; however, there are public toilets in the village of Llangoed which is close by. This lovely nature reserve supports a wide variety of plants, birds and insects. 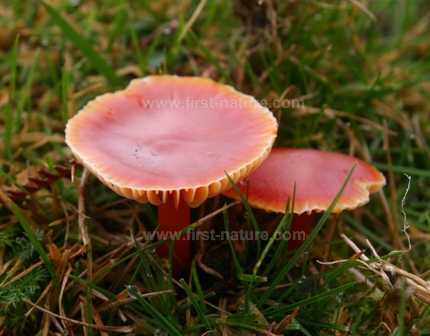 On our first visit, in late autumn, we were delighted to find bright red waxcap fungi growing beside the paths. No matter what time of year you visit, it seems the gorse is always in bloom; two species occur there, Common Gorse (Ulex europeaeus) and Western Gorse (Ulex gallii) which perhaps accounts for this. 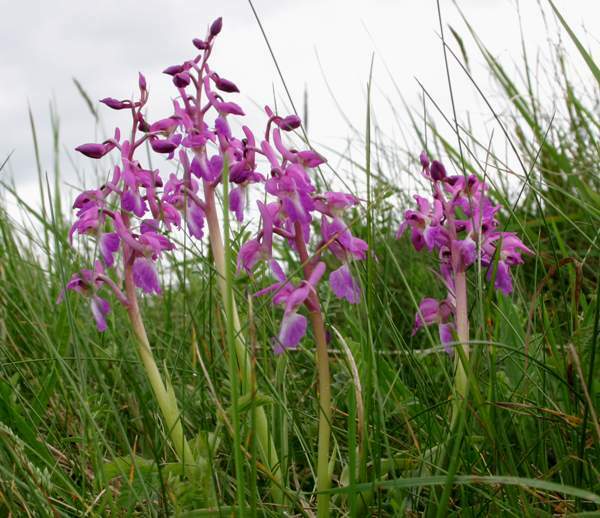 In patches of ground between the gorse, and in the open areas where rabbits graze and keep the grass short, there is a wide variety of plants including Early Purple Orchid (Orchis mascula), Fragrant Orchid (Gymnadenia conopsea), Spring Squill (Scilla verna) and Fellwort (Gentianella amarella). In less heavily grazed areas there are Columbine (Aquilegia vulgaris) and Gromwell (Lithospremum officinale). The old quarry also has its own special flora, and both the Bee Orchid (Ophrys apifera) and Pale Flax (Linum bienne) can be found there along with Soft Shield Fern (Polystichum setiferum) and Broad Buckler Fern (Dryopteris dilatata). Birds seen on this site include two owl species - both the Tawny Owl (Strix aluco) and the Barn Owl (Tyto alba) nest nearby and hunt over the reserve. The gorse attracts Linnets (Carduelis cannabina), Yellowhammers (Emberiza citrinella), Willow Warblers (Phylloscopus trochilus), Stonechats (Saxicola torquata) and many others that also nest in Mariandyrys Nature Reserve. If all this is not enough to make the steep walk up to the reserve sufficiently worthwhile, some 20 butterfly species and more than 80 kinds of moths have been found on the reserve. The butterflies include the Grayling (Hipparchia semele), Brown Argus (Aricia agestis), Red Admiral (Vanessa atalanta) and Painted Lady (Cynthia cardui). The grassland plants are ideal food for their caterpillars, and the pupae over-winter in the heathland.